Friday I posted more of a classic black and white holiday style idea. Today is the same basic color scheme, but a little on the edgy side. I am not sure this would be considered a holiday look, but definitely one that would be fun for date night or girls night out. I got this black fur vest from Lookbook a few months ago. I have a similar one from last year, but like this one a little better because of the longer length and it's ability to cover my backside. 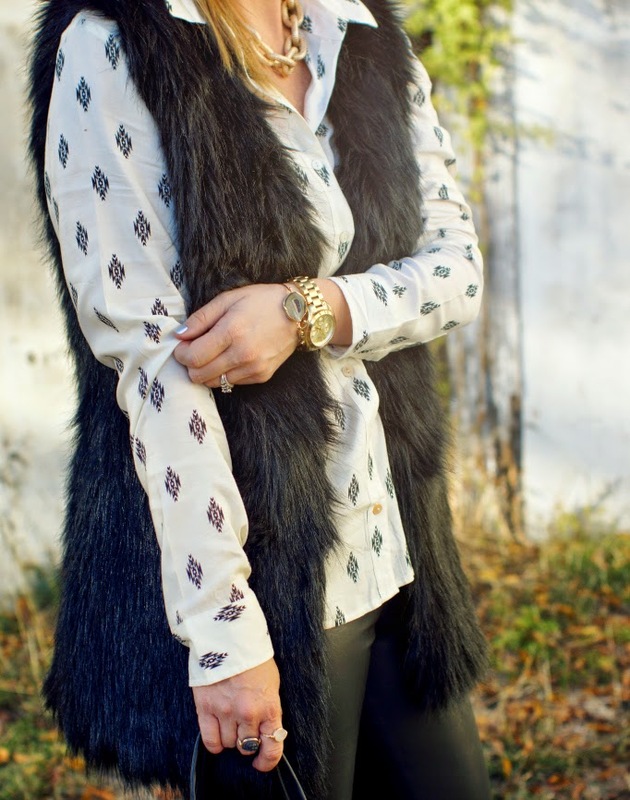 If you have yet to purchase a faux fur vest, I highly recommend this one. With it's affordable price and quality, it is money well spent and a piece that can be dressed up or down over the next several months. I was going to pair the vest and Forever 21 top with black skinny jeans, but mustered up the courage to go with black faux leather leggings from Wallis. They are more or less liquid leggings instead of pants. I have been on the fence about actually wearing them because of how form fitting they are, but I will definitely be playing around with other ways to style them again soon. I suggest wearing a loose fitting top if you are interested in trying out a pair for yourself. They are a fun change of pace and a chic, modern alternative to skinny denim. I hope everyone had a great weekend! We got our Christmas tree and indoor decorations up. It's tradition in our house to get everything decorated the weekend before Thanksgiving. That way, once we get home from visiting family, we can sit back and enjoy. I may or may not have almost burned down an entire 3-wick Peppermint Twist Bath and Body candle over the last 48 hours. It's a serious addiction this time of year. I love this edgy look, it's so cool. I am behind for the Holidays it's not even funny. These leggings look absolutely amazing on you! So perfect with the vest. And yay for getting your decorations up...hope to do ours this week! Oh wow, I love this outfit Shanna. You look fantastic! You seriously look great. I don't think I have the courage....or the place to wear them, but you make them look chic, edgy and appropriate for a fun date night or holiday party. I love how you styled these amazing leggings! So gorgeous on you! Is that Sandy from Grease I see? Owww oww! "I got chillzzzz, they're multiplyinnn..." :) XOX! I'm going to forever 21 today just so i can recreate this whole adorable outfit. CUTE CUTE CUTE. I need to bust out my Rachel Zoe fur vest although I always feel like mine is a little TOO bulky on me. I am LOVING the backdrop for these photos...so gorge! Miss you girl! You look freakin' amazing --- these leggings are HOTT!!!! This is fantastic! Love the leggings and faux fur combo! LOVE this edgy look on you, you are so rocking it!! I really need a pair of liquid leggings in my life! Good for you for decorating I've been so disorganized this year so need to get the tree up soon. Such a gorgeous look! 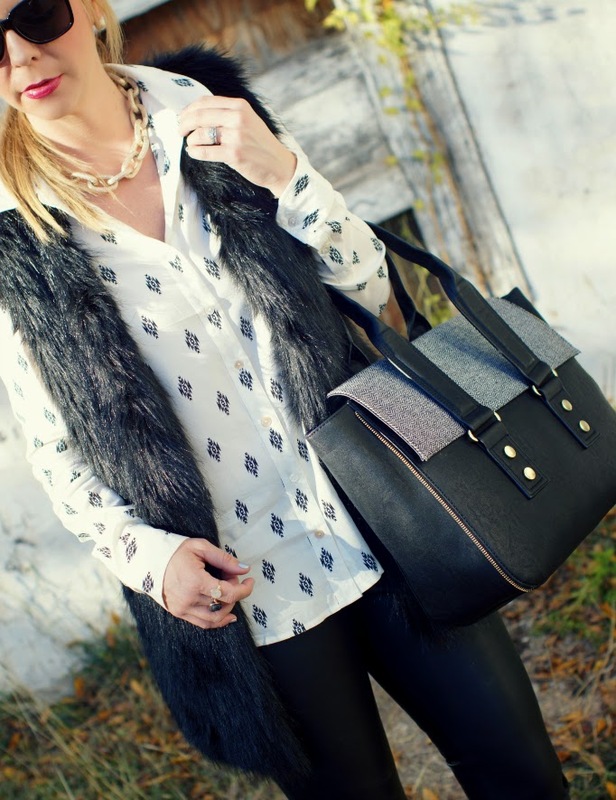 Love the fur and leather :) The button down is so chic! You are so right - classic with a bit of edge :) Love that top!! Happy Thanksgiving Week! I just love how you paired a fur vest with leather! It it is so chic! Looking every inch slick & sassy for the holidays in this combo Shanna!! Wishing you already a lovely Thanksgiving! Those liquid leggings look fab on you! Hot mamma!!! I love that fur vest as well - I really do need one in my life! I have never been a fan of the leather look leggings until now!! Wow! You rock this look! I want thus whole outfit! !